You knew it was going to happen, sooner than later. A band has used Apple's GarageBand for iPad to record an album. 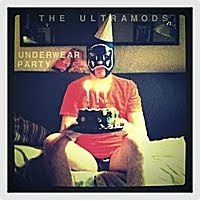 The Ultramods claim to be the first band record all instruments and vocals for an album using the iPad version of GarageBand for iPad. The 12-track album, Underwear Party, is now available in the iTunes Store for $10; you can also stream it for free on the band's site. The band, which writes "pervy pop punk" and "technologically obsessed new wave," told The Loop, that even the vocals were recorded with the app using the built-in microphone. Of course, the Ultramods aren't the first band to go all-in with the iPad to record an album. In November 2010, the alt-rock/fictional project band Gorillaz announced that it had recorded its next album, The Fall, entirely on an iPad, albeit with a variety of third-party music apps. While The Fall was released to the band's fan club members in December, it's currently available for pre-order on the iTunes Store, and will arrive on April 19 for the general public.